I have previous stated elsewhere that I only enjoy Margaret Atwood’s dystopian futures. Alias Grace is not a dystopian future, but is historical fiction, which is my favourite genre. 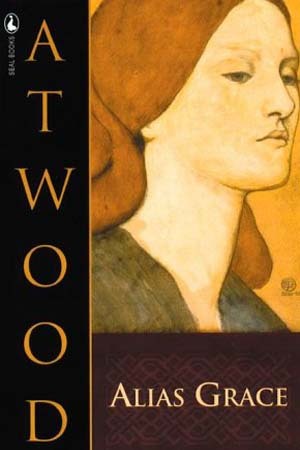 While it took me a while to get into the story, Atwood likes to switch between the perspective of a doctor and the perspective of Grace herself which makes the story feel disjointed at times, I fell into its pace quickly. Alias Grace, is Atwood’s take on the notorious 1843 murders of Thomas Kinnear and Nancy Montgomery. While I had originally anticipated the book to be Atwood’s reconstruction of the events, the story was much more. The novel is not an attempt to blame Grace Marks for the murders, nor is it an attempt to dissolve her from guilt. It took me a while to realize what Atwood was trying to do, but from my point of view she was trying to show the how Grace Marks was viewed at the time, especially through the eyes of a (fictional) doctor conducting research into criminal behavior, and the media. Atwood also writes from Grace’s point of view regarding events leading up to the murders and after her conviction but when written from Grace’s point of view, the reader is not sure if Grace is speaking or thinking, thus if the events are true, making this read even more intriguing. There is no question that Atwood is a wonderful story teller and she spins the story of Grace Marks in such a twisted and interesting way. While Grace is the main character in the story, the reader never gets a true grasp on who she really is. Even through her own perspective, Grace’s character seems to shift into all the different roles ascribed to her, a murderess, a seducer, an innocent servant tricked by a jealous farmhand. Just as historically no one was sure if Grace Marks was guilty or not, the reader is left similarly wondering the same thing. This entry was posted in Reviews and tagged Alias Grace, Book Review, Canadian Literature, Grace Marks, Historical Fiction, Margaret Atwood, Murder, Novel on December 15, 2014 by kwils3. Sounds not dissimilar to Burial Rites by Hannah Kent. This looks like a great read… thank you! Have you read The Handmaiden’s Tale By Atwood? It is a fantastic read – really thought provoking and quite frightening. I write a views, news and tips blog for twenty-something’s… Here is one about my top 5 books – have you ready any of these? The Handmaid’s Tale was my favourite Margaret Atwood book until I read this one. If you like her dystopian fiction you should read the Maddadam Trilogy. I haven’t read the books you listed, but The Rosie Project, Mr. Hemingway, and The Goldfinch are all on my TBR list.